This afternoon and evening we had more rain and thunderstorms and it's really beginning to get old now. I am so ready for the cool crisp air that autumn brings and ready for this heat and humidity to be out of here. I made a quick and super easy meal this evening. I pulled out my cast iron skillet and decided it was going to be a one-pan, 2 ingredient meal (not counting the little bit of oil added to the pan). I sliced up several links of my favorite Aidell's Smoked Chicken Apple Sausage (nitrite and nitrate free) and cut up a couple of crowns of fresh broccoli into florets. I browned the sausage in a little bit of oil while I was cutting up the broccoli. I lightly steamed the broccoli florets for about 2 minutes on high in the microwave (covered in a glass casserole dish) without adding any water; using only the little droplets of water clinging to the freshly washed broccoli as the liquid for them to briefly steam in. They were still nice and bright green when done. I moved the browned sausage over to a small plate and tossed in the very lightly steamed broccoli florets and let them brown for a bit, then added back the sausage and stir fried it a bit more...and BOOM; dinner was ready. It was super delicious. I typically make this with brussels sprouts or shredded cabbage but really enjoyed it with the broccoli this evening. I kept the broccoli tender crisp with some bite to it. Aidell's makes many different flavors of smoked sausage that you can choose from; you can also swap out your favorite kind or brand as well. I have enough leftover for my lunch tomorrow, too. Hubby and I really enjoyed this simple meal. I snapped a couple photos below and included the easy peasy recipe. Enjoy! In a 10-inch skillet, heat oil over medium-high heat and brown sausage on both sides. While sausage is browning, very lightly steam broccoli for about 2 minutes (I cooked it at high in the microwave for 2 minutes without adding water, only the droplets of water clinging to the florets). 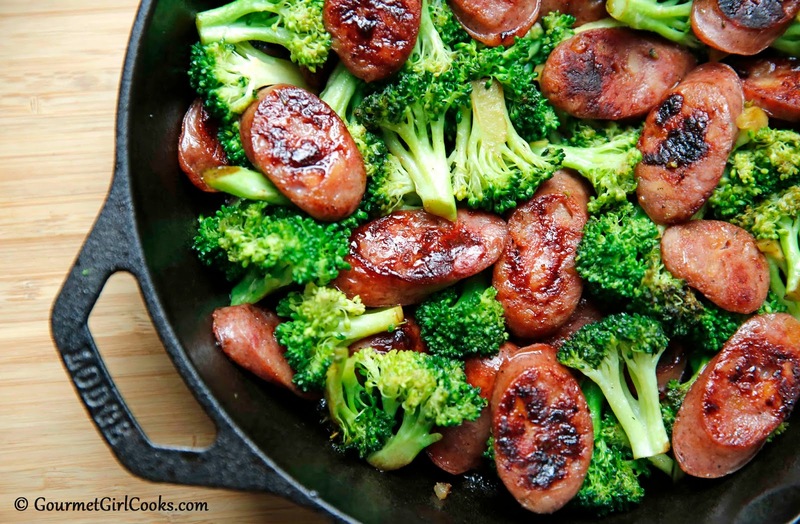 Transfer the sausage to a small plate and add well drained broccoli florets to the skillet and cook until broccoli is lightly browned, about 3 to 4 minutes (adding additional oil, if necessary). 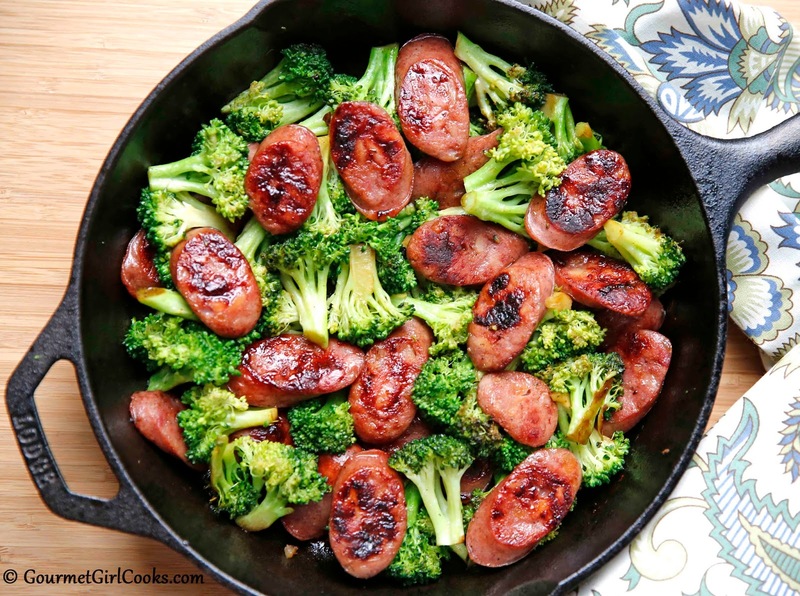 Return sausage to the skillet and heat together with broccoli for an additional 2 minutes or until hot. I just love all your variations on this theme and now here's another gorgeous one to add to the arsenal! I'll be preparing this simple and colorful recipe soon! :-) We keep Aidell's on hand all the time now. Our favorite is the spicy Cajun Andouille. We had a beautiful day yesterday. The heat & humidity broke for the time being and we had a nice sunny day with temps in the low 70s. It was chilly and rainy today, but expecting pleasant weather again before getting back into the 80s next week. I imagine it will be a bit of a roller coaster for a while yet, but there are little tell-tale signs that we're finally beginning to approach the start of *Autumn*! I must tell you that I *really liked it with broccoli...more than I thought I would. I left some bite in the broccoli which I think added to it. Not sure I would have liked it with fork-tender broccoli. Hubby really enjoyed it as well.